After topping $1 billion for the first quarter ever in Q3 2015, US-based airline baggage fees dropped to “just” $958 million in the 4th quarter of 2015. However, for the full year of 2015, airlines reported over $3.8 billion in revenue from baggage fees — the most reported in any year. American Airlines — with data combined with US Air — topped the list again in 2015, charging over $1.1 billion in baggage fees. While this is a lot, this accounts for less than 3% of AA’s $41 billion in revenue for 2015. From 2014 to 2015, there were a few big increases (Frontier, Allegiant and JetBlue) and just one notable decrease (Southwest). Ultra-low cost carriers (ULCCs) Frontier and Allegiant saw their baggage fees soar this year as they continued to expand. Meanwhile, JetBlue can credit most of its 71% increase to eliminating the free baggage allowance in June 2015. Interestingly, Southwest’s baggage fees dropped 40% from 2014 to 2015, while Southwest increased passenger boardings by 6.5% over the same time. Baggage fees per passenger fell to an amazingly low $0.30 per passenger boarding in 2015 vs. $0.54 per boarding in 2014. It seems Southwest passengers are learning to avoid its few baggage fees. The Amex Gold Delta SkyMiles Card gets you a free checked bag for you and up to eight of your travel companions. The baggage allowances vary across these cards, but each allow at least one free checked bag for the primary cardholder. Some cards offer free checked bags for others booked on your same itinerary. Unfortunately, the airlines ranked #4 through #6 — Spirit Airlines, Frontier and Allegiant — don’t have co-branded credit cards that offer a free baggage allowance. Credit cards such as the Citi Prestige ($250 per year), The Platinum Card® from American Express ($200 per year) and Premier Rewards Gold Card from American Express ($100 per year) each offer airline fee reimbursements each calendar year. These can be great for reimbursing you for baggage fees, if you weren’t able to avoid them otherwise. Or, you can use points earned on your Capital One Venture Rewards Credit Card, Bank of America Travel Rewards credit card or Barclaycard Arrival Plus World Elite Mastercard to get a statement credit for your baggage fees. However, you’ll likely want to pay for your bags when you purchase your flight if you plan on using your Barclaycard Arrival Plus points, as the minimum redemption for this card is 10,000 miles ($100). With JetBlue giving in last June, the last airline offering free checked bags to all passengers is Southwest. Each passenger is still allowed two free checked bags — including golf bags and skis — up to 50 pounds and 62 inches. Easier said than done, right? 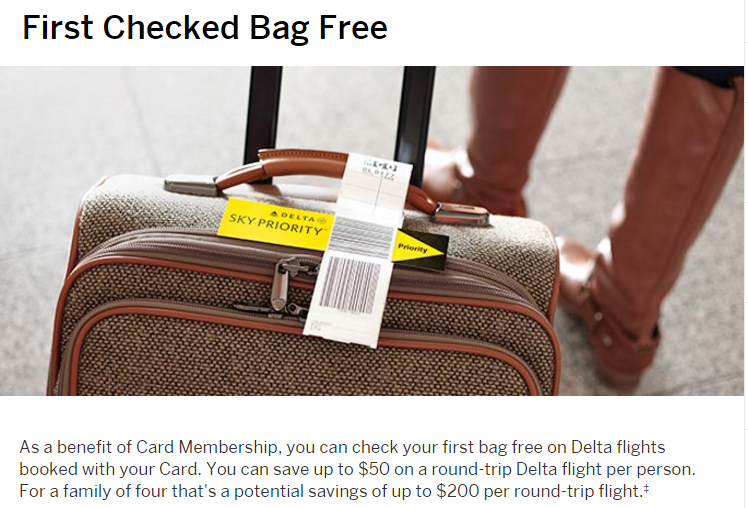 But earning elite status on any of the top three bag fee-charging airlines — American, Delta and United — will earn you at least one free checked bag. Even base-level elite members (American Gold, Delta Silver and United Silver) are allowed to check one bag for free on domestic routes. Consider doing a status challenge (or match, if available) if you’re looking to “level up” quickly. What’s your strategy for avoiding bag fees?